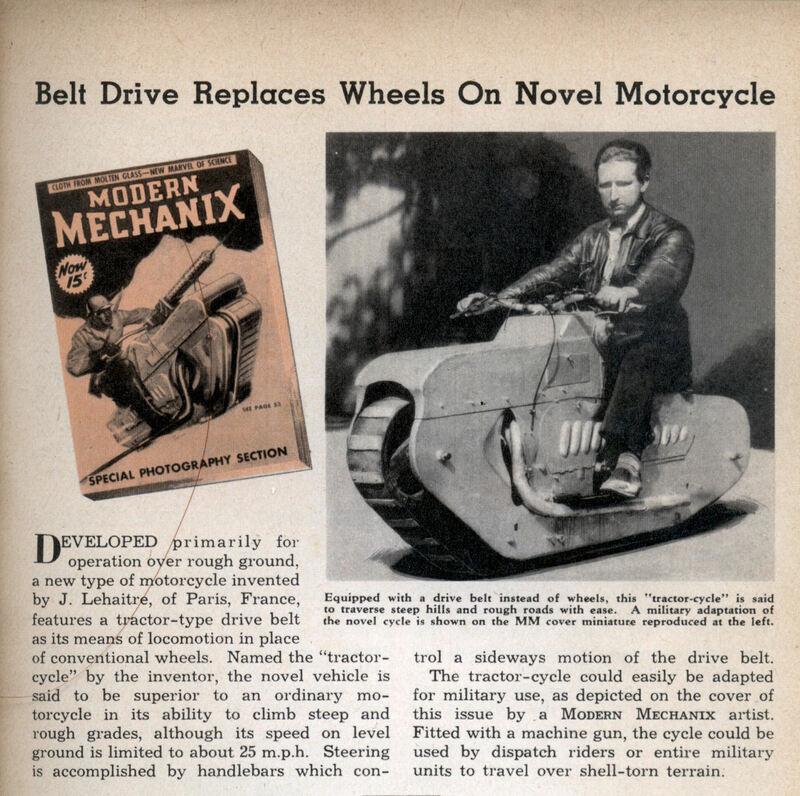 DEVELOPED primarily for operation over rough ground, a new type of motorcycle invented by J. Lehaitre, of Paris, France, features a tractor-type drive belt as its means of locomotion in place of conventional wheels. Named the “tractor-cycle” by the inventor, the novel vehicle is said to be superior to an ordinary motorcycle in its ability to climb steep and rough grades, although its speed on level ground is limited to about 25 m.p.h. Steering is accomplished by handlebars which control a sideways motion of the drive belt. 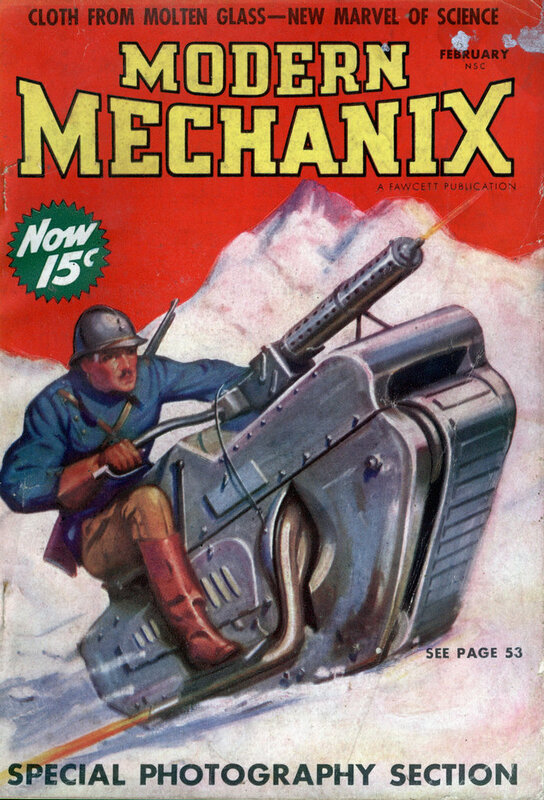 The tractor-cycle could easily be adapted for military use, as depicted on the cover of this issue by a Modern Mechanix artist. Fitted with a machine gun, the cycle could be used by dispatch riders or entire military units to travel over shell-torn terrain. Indeed, only good on thick snow, which to a tank tread is the equivalent of a freshly tarred highway. Race this beast vs. an off-road motorcycle up a rocky desert region hill, like in Utah. The motorcycle can steer on a dime, around rocks, or even jump over them by doing a wheelie first and, well, you know how kids pull wild stunts on anything with wheels. The motorcycle has massive 1-2 feet of clearance along with shock absorbers that travel at least a foot as needed, whereas this has zero of each. And there’s no BALANCE, just there is in a high speed motorbike with its tires acting as gyroscopes and self-correcting man/machine steering feedback devices. Oh, and just like a real TANK, check out the protective armor this guy gets from this leg-crushing tip-over contraption that costs a million dollars. This does bring to mind though Dean Kamen’s prototype “off road” Segway-like ATVs that could auto-balance on front or back wheels so you really needed a seat belt or good boot clamps to hold you onto the crazy thing as it climbed up 80 degree inclines, ha ha. Steering is accomplished by handlebars which control a sideways motion of the drive belt. Funny thing this concept is not completely dead, I just saw a YouTube video for Hyanide Scooter that looks in general very similar.